EBC Brakes have become the largest manufacturers of disc brake pads in the world and are worldwide leaders in motorcycle road and race brakes. They have developed a range of brake pads for every aspect of motorcycle braking for Harley Davidson Motorcycles. Semi-Sintered series V-Pad combining the very best features of organic pads with the life time of a sintered pad, these part sintered 30% copper content organic brake pads extend lifetime considerably over Kevlar disc pads. Harley Davidson 883 N Iron (2009 to 2013) EBC Front Brake Pads (FA381) and Rear Brake Pads (FA387). Available in either:- 'Kevlar' Series, V-Pad or 'HH' Sintered Series. 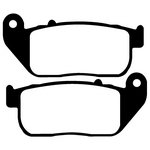 Davidson 883 N Iron (2014 to 2017) EBC front brake pads (FA640) and rear brake pads (FA254). Available in either:- 'Kevlar' Series, V-Pad or 'HH' Sintered Series. Harley Davidson XL50 50th Anniversary Sportster (2007) EBC Front Brake Pads (FA381) and Rear Brake Pads (FA387). Available in either:- 'Kevlar' Series, V-Pad or 'HH' Sintered Series. 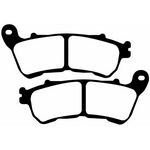 Harley Davidson XL / H Sportster 883 (2000 to 2003) EBC Front Brake Pads and Rear Brake Pads (FA400). Available in either:- 'Kevlar' Series, V-Pad or 'HH' Sintered Series. Harley Davidson XL 883 R 100th Anniversary Edition (2003) EBC Front Brake Pads and Rear Brake Pads (FA400). Available in either:- 'Kevlar' Series, V-Pad or 'HH' Sintered Series. Harley Davidson 883 C Sportster Custom (2004 to 2008) EBC Front Brake Pads (FA381) and Rear Brake Pads (FA387). Available in either:- 'Kevlar' Series, V-Pad or 'HH' Sintered Series. 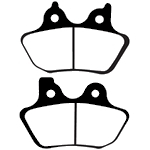 Harley Davidson 883 Sportster R (2005 to 2013) EBC Front Brake Pads (FA381) and Rear Brake Pads (FA387). Available in either:- 'Kevlar' Series, V-Pad or 'HH' Sintered Series. Harley Davidson 883 R Roadster (2014 to 2015) EBC front brake pads (FA640) and rear brake pads (FA254). Available in either:- 'Kevlar' Series, V-Pad or 'HH' Sintered Series. Harley Davidson 883 R Roadster (2010 to 2013) EBC Front Brake Pads (FA381) and Rear Brake Pads (FA387). Available in either:- 'Kevlar' Series, V-Pad or 'HH' Sintered Series. Harley Davidson 883 Low (2004 to 2010) EBC Front Brake Pads (FA381) and Rear Brake Pads (FA387). Available in either:- 'Kevlar' Series, V-Pad or 'HH' Sintered Series. Harley Davidson 883 Superlow (2011 to 2013) EBC Front Brake Pads (FA381) and Rear Brake Pads (FA387). Available in either:- 'Kevlar' Series, V-Pad or 'HH' Sintered Series. Harley Davidson 883 Super Low (2014 to 2017) EBC Front Brake Pads (FA640) and Rear Brake Pads (FA254). Available in either:- 'Kevlar' Series, V-Pad or 'HH' Sintered Series.